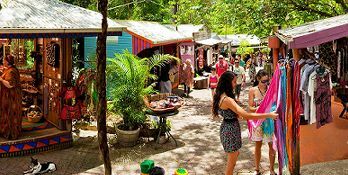 Located in the Rainforest of Kuranda, these markets feature tropical garadens, gourmet regional fare, contemporary art, great clothing, jewelry, home made food products, events and more . . . even a mini golf course! Looking for a great marketing venue to sell your art, crafts, clothing, products and more ? Kuranda Original Rainforest Market enjoys thousands of vistors coming through every year through our own marketing efforts as well as word of mouth. A successful way to sell to a captive audience wandering through the market.